I spent the night in the South Cow Mountain OHV Recreation Area, in the Mayacamas Mountains between Clear Lake and US101. I had driven as far as I could manage in my low-clearance van to the summit of Red Mtn, a bonus peak while in the area chasing down a few P1Ks. After some reading I had settled down to rest before 10p, planning an early start in the morning. It would not be long before my sleep was interrupted. A highly modified truck, two serious off-road vehicles and a motorcycle came noisily into the clearing where I had parked next to a collection of large boulders scattered about. What I didn't know at the time was that these large boulders were part of a playground the OHV crowd uses as a proving ground of sorts. While I had thought that all these folks had settled down for the night when I'd passed through the campground earlier, it seems they were just getting a second wind. Fueled by alcohol, testosterone and 2,000W floodlights, they spent the next half hour manuevering their vehicles through this boulder field to see what their machines could do. There was much shouting and whooping and dust flying all about as first one, then another would try some manuever or other. All great fun, except for the guy haplessly trying to sleep. They eventually drove off to another site, returned briefly half an hour later, finally to leave before midnight. A second group of vehicles came by an hour later for their go at the playground. They got out to enjoy the stars and stillness with slurred conversations briefly before firing up their machines for more nighttime mayhem. Clearly I had chosen the worst possible spot to spend the night. I'd have slept better parked on the shoulder of US101. Sometimes, that's just how it goes. At least they didn't vandalize my van or physically assault the old guy sleeping in it. A little before 7a I was up and on my way for the short 10min hike to the summit of Red Mtn. Partially overcast skies hid the sun while I stood at the summit. To the north rose the higher Cow Mountain (where I'd gone the previous evening) and to the east the higher Pyramid Ridge (where I was heading to next). To the west and south were fine views overlooking fog-enshrouded valleys tucked in the coastal hills. The summit also sported a 1949 USGS benchmark. On my way back I inspected the boulder field a little more closely - it wasn't as imposing as it had seemed at night, but there was one feature, an arching ramp that looked like it would be quite formidable. In any event, I can't recommend this as a place to sleep undisturbed. This P1K is located in the southern part of the recreation area. The dirt road I had driven in on, dusty but well-maintained Scotts Valley Rd, crosses west-east through the recreation area to Lakeport at Clear Lake. I drove east a few more miles and parked at a junction with one of the more difficult OHV routes. The current routes don't exactly match the most recent topo nor the GPS I was using to navigate. The old track shown on my GPS which I planned to use has been decommissioned, but I used it nicely to get from Trail 10 to Trail 11. At the top of a ridge is a fork and I turned right here to follow a motorcycle track (Trail 12) that winds its way around the west side of Rickabaugh Glades, a private inholding inside the recreation area. This trail is quite rough and overgrown, with poison oak encroaching uncomfortably in many places. After crossing a wooden bridge the trail climbs up to Pyramid Ridge south of the private property, where it joins a wider, better trail that traverses the ridge. According to the topo map, the highest contour on the ridge is located about half a mile west of this junction. I followed the trail along the ridge until it starts dropping down towards Morrison Creek. The highpoint is supposed to be just to the northwest, off the road through the chaparral about 300ft. But as I started this nasty little bit of bushwhacking, I could see that the point I was aiming for was obviously lower than where I stood - seems the maps aren't all that precise when it comes to contours. After returning to the junction with the motorcycle track, I decided to take the old, decomissioned trail through Rickabaugh Glades to see if it wasn't a better route than the motorcycle track. It was. Better, I found that the initial highpoint just north of the junction was 12-15ft higher than what I had thought was the highpoint of Pyramid Ridge. The trails leads to a high meadow area, dry and golden brown at this time of year. I half expected to see a few cows grazing, but saw none. There was no signs that cows had ever grazed here, and in fact there were no structures or any evidence besides the old road that people and their things had used this site. This little private inholding might be the most pristine part of the entire area. Through my two days visiting the Cow Mountain Recreation Areas, North and South, I saw not a single cow pie - kind of ironic considering the name. The road through the glades led back to a gate at Trail 11 which I then used to return the way I'd come - this was certainly a much better route than the Motorcycle trail I'd used that avoids the private property. Back at the van, I continued through the recreation area on Scotts Valley Rd all the way to Lakeport, the last 3-4mi back on pavement. I stopped briefly at the grocery store for a few supplies I'd neglected, then headed north on SR29 to US20, then north into the Mendocino NF on Sam Alley Ridge Road. I had expected this latter dirt road to be somewhat rough but it turned out to be in excellent condition. The lookout ranger I met later told me the road had been "fixed" less than a year ago. It was only mildly dusty and washboarded but well-packed, making for easy driving. The road makes its way in about 7-8mi to a 4,000-foot ridge running NW-SE. 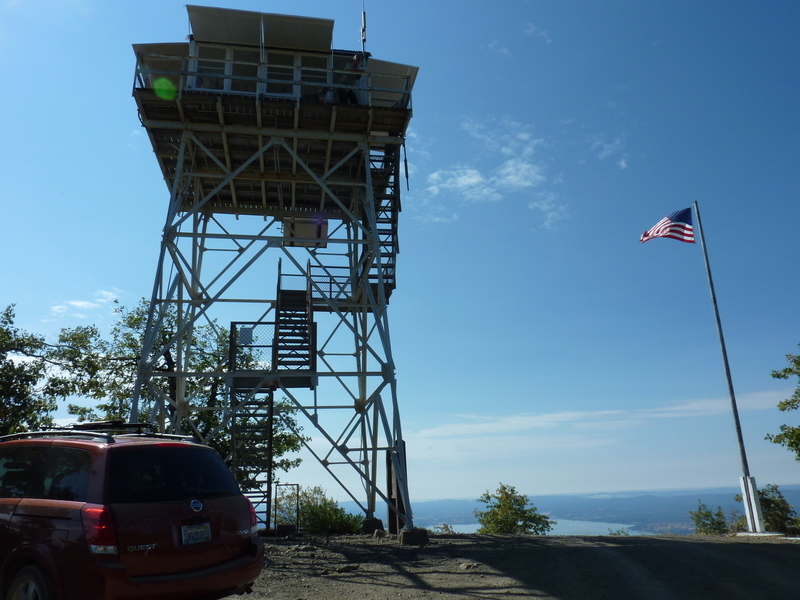 The highpoint, only a mile from where Sam Alley Ridge Rd meets the ridgeline, is a P1K with a USFS lookout still in service. The side road leading the summit is rougher and I probably should have parked and walked it, but I managed to grind my way to the top with only a few bumps to the undercarraige. Jasper announced my arrival with an eager bark. The ranger was a very friendly one, inviting me up for a visit, her dog as friendly as could be. The ranger lives in Upper Lake at the foot of the mountain near Clear Lake, commuting to the summit during daylight hours to man the lookout. She was engaged in a rousing game of solitaire when I arrived and seemed to welcome the interruption. The views in all directions were quite outstanding, and I photographed the four directions from the viewing platform encircling the main cab ( N - E - S - W). She told me all sorts of things about her station, much of which I didn't remember for long. I was interested in nearby Sky Rock which I pointed out to her, but she immediately told me she would not recommend it. It's harvest season in the area and all cross-country travel is to be strictly avoided, according to her. I was sure she misunderstood me as I countered, "No I mean that rock right there, just off the road - does anybody climb it?" She knew what I meant and even 1/3mi of cross-country went against her recommendation. I would have to do this one without her help. She told me more about the pot farmers in the area and how she hated them with a passion because of the trouble they cause. I'd seen evidence of abandoned farms and the trash they leave and had no disagreement with her. I wasn't eager to have an encounter during harvest, but I really didn't think a short stroll down a brushy ridge was going to be much of a problem. She did recommend a short stroll along the ridge to the east which I did after leaving the lookout, but I didn't get as far as she suggested due to brush and poison oak. My interest in the minor point was not enough to get me to look very hard for a better way to reach it. Back at the van, I drove down to the main road and then a short distance north to park along the road. 1/3mi down the SW embankment was a most interesting outcropping called Sky Rock, a CC-listed summit. I knew from the satellite view that it might be a very brushy affair but it looked like a few ravines on either side might be usable as less-brushy and the total distance was not all that far. The ravine I descended turned out to be an excellent choice. Only a minor bit of brush was encountered, and no poison oak. The last 50yds getting from the ravine to the base of Sky Rock was the brushiest, but not really bad, taking all of about 15min from the time I left the car. The rock outcrop itself is formidable on at least two sides, the east and south. I circled around to the north side to find a mossy but manageable class 3 route up to the summit. Beer cans and some broken glass marked previous visitors. The views are nothing special as the rock isn't all that high, perhaps 50-60ft, but the scrambling was the best on the day. From the summit I noted a faint use trail running part way up the rounded ridge between the two ravines leading back towards the road. I decided to follow this as perhaps a better route than the ravine I had followed. It was far from better. The use trail gave out before I was half way back to the car and some rather thick and frustrating brushwhacking ensued. I eventually flailed my way back to the ravine and went back up that easier path to lick my wounds back at the van. The brush had left me scratched, bleeding and a bit battered, my pants a little more shredded than when I had started. I really need to replace that pair. Less than half a mile north of Sky Rock and just off the road is a formation called Red Rock, an easy bonus peak while I was in the area. The top is a simple hike without any brush. At first it seems silly that this rounded bump is even called Red Rock - nothing red and very little rocky about it. But just north of the highpoint is a lower point that is the rock outcrop for which it was undoubtedly named, though the map has the label mislocated to the higher point I first reached. I made the short stroll down and then up the reddish colored feature, a very simple affair from the road. The north side features a very steep drop of more than 100ft and from that direction it probably looks more impressive. I didn't drive further along the road to verify it however, returning back to the van and then driving back down to Upper Lake. Once back at Upper Lake, I headed west on US20, then north on US101. Roughly halfway between Ukiah and Willits, on the east side of US101 is the poorly named Laughlin Range. It forms part of the divide between the Eel and Russian River watersheds but is in no way a distinct range of mountains within the coastal ranges (of course this can be said about a number of other ranges along the North Coast including the Marble Mtns, Trinity Alps, Yolla Bolly Mtns, Scott Mtns, and others), but it wouldn't be the first of the "weak" range highpoints I would go after. Better, the highpoint is a P1K which by itself was a reason to go after it. The problem with this one is that it is located completely on private property. The good news is that the upper mountain is home to a number of telecom towers and these tend to be easy to visit with lax security. The lower portion of the mountain on the west side is part of a Wilderness Unlimited hunting ranch with a gate on US101. On the highway shoulder, just before the gate, I was inside the van getting ready when I found a Wilderness Unlimited pickup truck exiting. I was lucky I hadn't tried to start just a few minutes earlier. After relocking the gate the truck left, heading south. I quickly exited the van and hopped the gate to start up the road leading to the summit in four miles. A WU campground is located off the road, alongside the highway about 1/3mi from the gate. I imagined that the truck had been in here to check on the campground and possible occupants - perhaps verifying that only club members were present. I saw no other vehicles or persons at the campsite or elsewhere on the mountain for the few hours I was there. After following near the highway to the campground, the road then veers away from the road noise, passing through a second gate (this one with a simple chain latch) before crossing a dry creekbed and a set of old railroad tracks no longer in use. It then begins a steady climb up the mountainside, at first through shaded forest but eventually breaking out into more open, chaparral-covered terrain found on the south side. Here views open some to the surrounding hills to the south and west. There are at least four different communications installations spread over the mountain with various road forks to reach each of them. I hiked to the highest one at about 3,300ft. Partial views south and west can be had from the summit, but for the most part the views are taken up by tall trees that cover much of the top. Jogging on the way down helped keep the outing to 2hrs and it wasn't until I pulled back onto the highway that I was fully relaxed. 15mi NW of Willits is another P1K, Strong Mtn. The mountain is five air miles west of US101 in an area that has virtually no public lands other than some of the roads. I did not expect my chances of reaching the summit to be very good. On the plus side, Sherwood Rd, half of it paved, weaves for 15mi out of Willits into the rural hills surrounding Strong Mtn, with various branches coming close to the summit. Google's StreetView goes only as far as the paved section so I wasn't sure which of the unpaved portions were publicly accessible and how close I could get. I did know that there was a home practically on the summit, so it would not be an easy feat to reach it. After stopping in Willits briefly for gas and iced coffee (but no Karma), I decided to drive out on Sherwood Rd to at least explore the area and see where I could drive to. My luck was exceptionally good this afternoon as I found I could drive to within a quarter mile of the summit on the west side, to the high junction between Stagecoach and Ridge Ranch Rds, both unpaved and unsigned. The GPS was quite helpful in getting me to take all the right forks to reach it. The steep, wooded West Ridge could be used to access the summit and after quickly parking I headed up the initial grassy lower slope before disappearing into the trees found higher up. A use trail is found in the forest understory, following the ridge with a white PVC water line that snakes down from the summit to destination unknown (there was no water in the pipe, so it may be abandoned). The use trail helped me avoid poison oak which I had noted lower and made quick work of getting to the summit - in less than 15min. The summit is somewhat flat and open with a water tank just below on the SW side. As I stood on the highest point I could just see the roof of the summit home to the SE past the water tank. I took a single photo looking southeast (trees blocking most of the other views) before retreating quickly so as not to press my luck. I was a bit surprised that the summit home had absolutely no views from its location - it was placed out here more for privacy I imagine than the potential views. Back at the van, I was happy to have gotten up and down without seeing another soul or vehicle and I wasted no time driving back to the highway. I love the north inland coast range placenames. Bob--do you have any idea as to why "Glades" are so found here vs....anywhere else in the West? Bob replies: Sorry, I don't.